We consider Class-Uniformly Resolvable frames (CURFs), which are group divisible designs with partial resolution classes subject to the class-uniform condition. We derive the necessary conditions, including extremal bounds, build the foundation for general CURF constructions, including a frame variant of the λ blow-up construction from part I. We also establish a PBD-closure result. For CURFs with blocks of size two and three we determine the existence of CURFs of type gu, completely for g=3, with a small list of exceptions for g=6, asymptotically for g=4,5 and give some other infinite families. Danziger, P. (Peter), & Stevens, B. (2004). 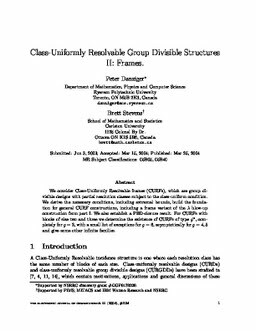 Class-uniformly resolvable group divisible structures II: Frames. Electronic Journal of Combinatorics, 11(1 R).